The city of Yaroslavl is on the Golden Ring route, which passes through old Russian cities with classic monuments to the culture and history of old Slavic Rus. In addition to Yaroslavl, the Golden Ring includes 11 other cities located within an easy distance from Moscow. The city center is small enough to visit all the main attractions on foot. Even more important, you do not need to go out of your way to find them, because virtually every building and church is a monument. Yaroslavl is a small city and the classical architecture—as extolled by Russian literature—coexists harmoniously beside Soviet-era buildings imbued with the spirit of socialism and modernism. The passing embankment boulevard with rotundas stretches nearly 3 kilometers (1.86 miles) along the Volga. From one side you can gaze at attractive facades, and from the other you’ll discover picture-perfect views of the river, numerous churches and the banks opposite. This place is beloved by young people, so on Fridays and Saturdays you can see how Russians celebrate a wedding. Most of the painted churches, for which Yaroslavl is famous, stand along the Volga embankment. You can visit them one after the other before you get oversaturated with church architecture, frescoes and icon paintings. A must-see is the Church of St. Nicholas Nadein ( 2a Narodny Lane ), which dates from the 17th century and influenced the development of Yaroslavl architecture. The Church of Elijah the Prophet is an unusual specimen of Russian architecture—it looks more like the Roman Pantheon. The Cathedral of the Annunciation ( 51 Volzhskaya Embankment ) is an assemblage of a “warm” and “cold” church (exquisite domes and an unusual decor). There is also the Church of the Nativity ( 1 Kedrova St. ). It is then worth heading to the Rechnoy station ( 4 Volzhskaya Embankment ). This white post-constructivist building from the 1970s perfectly reflects its era. It stands directly next to the water—from its landing dock there is an enchanting view of the river and the vicinity. During the season, you can take a ride on the river tram from here (for example, to the Tolgsky monastery). There you’ll find Vanilla Sky, a decent restaurant with a dazzling view of the Volga. On the Volga embankment you can visit the Music and Time Museum, a surprising attraction and the first private museum in post-Soviet Russia. The museum is devoted to the odd collections of a magician-illusionist who had a Russian soul despite his non-Russian name, John Grigorievich Mostoslavsky. The museum contains old musical instruments, bells, phonographs, records, barrel organs, irons, clocks and samovars. The “old town” is located between Sobinov and Respublikanskaya Streets . Since 2005 it has been a UNESCO World Heritage site. As you wander leisurely between the low buildings, peering into the comfortable courtyards and nooks, you can see the epitome of the harmonious development of the 18th and19th centuries with churches, boulevards and interesting prospects. A bit to the side on Pervomaiskaya Street was the main 19th-century commercial center, the Gostiny Dvor. This type of structure is found in nearly every large Russian city. In the past, there was an organized market in the merchants’ galleries. The distinctive feature of Yaroslavl’s gostiny dvor is its rotunda, which has been preserved since the 19th century. Now, the area around the gostiny dvor is one of the city’s liveliest spots, making it an excellent vantage point from which to observe city life. The 1,000 ruble bill can serve as a special guidebook to Yaroslavl. It is illustrated with images of several interesting city monuments. The monument to Prince Yaroslav the Wise (on the front of the bill) is located on Epiphany Square. According to legend, this is the spot where the prince killed a bear and issued an order to establish a walled city (naturally, he named it in honor of himself). The monument pictured on the bill opened in 1993. The square also holds the main entrance to the Spaso-Preobrazhensky (Transfiguration of the Savior) monastery (“The Lay of Igor’s Campaign,” a major work of old Russian literature, was found here). Once you exit through the Holy Gates, which are close by, if you turn around you will see the same view shown on the bill: the chapel, birch tree, bridge, gates and tower. The chapel in the foreground stands out from the overall landscape—it was constructed in 1997 on the initiative of Yuri Luzhkov, the former mayor of Russia known for his particular taste. Incidentally, if you’d like to get a bird’s-eye view of the city, you can climb up to the observation deck of the bell tower of the Spassky Monastery. The back of the bill depicts the Church of John the Baptist ( 69 2nd Zakotoroslnaya Embankment ). In Yaroslavl you can’t take a step without seeing a breathtaking church, but this one deserves special attention even though it is not quite in the city center. It is on the other side of the riverbank, so it is best to take a taxi there. First, unlike most Yaroslavl churches, this one was created from ornamentally molded red brick, so the church is virtually devoid of even surfaces—the whole church is “carved.” Second, it has an unusual belfry that looks more like a tower. Art experts consider the church a masterpiece of Russian architecture, due not only to its outer decoration, but also to its frescoes and tiles. The church’s history is also uncommon—it was built exclusively from secular donations (on rainy days, the chapel is usually closed, but it is worth looking at it from the outside). If you tire of churches and artistic architecture, go to the Bolshaya Manufaktura (Large Textile Mill) neighborhood or the planetarium. 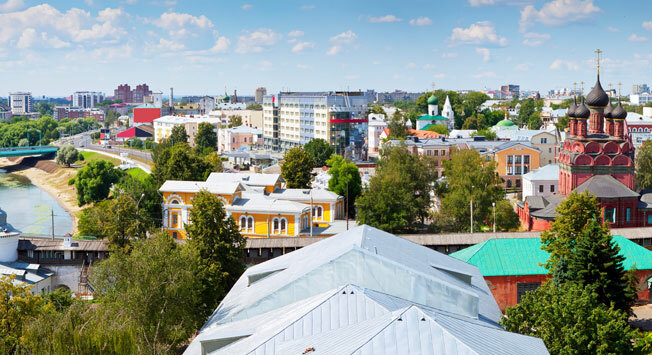 The textile mill complex is a colorful Yaroslavl neighborhood that is relatively unknown among tourists. It is between the Kotorosl River embankment and the railroad tracks. These neglected redbrick buildings formerly held textile businesses, dormitories and other accompanying lodgings. Now, there is a romantic decadence being created, but recently the neighborhood was acknowledged as an object of cultural heritage, so it may start coming back to life in the near future. Yaroslavl is the birthplace of the world’s first female cosmonaut, Valentina Tereshkova. The Yaroslavl planetarium is named after her. The unconventional futuristic building contains a telescope, a museum of the history of cosmonautics, rides and the “star” room, where real images of the starry sky are projected onto a large dome and there are frequent screenings of educational films about cosmic occurrences.